Browsing articles in "Diving Log"
Waking at 5.30am was a struggle on Saturday morning for our road trip to Vobster Quay but the excitement of finally getting to dive in the closest inland dive centre to Cornwall was building in the air, and cold air it was at that as we loaded the car in 1C. Sitting in the back of the car with Ralph in the passenger seat and Kurt Driving I was able to sit back and relax as we chatted about things like you do on a road trip. The conversation changed to left, no right at the next junction as we got closer to Vobster Quay. The way there is a little strange, winding through the quaint Somerset villages, passing Glastonbury Tor and the satnav app finally getting us to our destination. 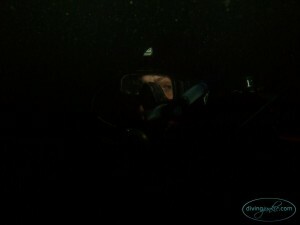 It was a great feeling and only just past 9am, leaving a whole day ahead of us to get at least 2 dives in. Personally I can’t wait for the day someone makes an app that gets one of these smartphones to teleport you to your destination. After we turned the sharp left onto the dirt road that enters Vobster Quay we arrived at a small wooden hut with a young man inside, we had a form to fill out; name, address, emergency contact and diving level and after being given a key ring with our number on we were allowed to drive down to the car park. 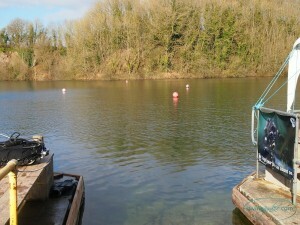 On the left we saw what looked like a submersible, then we rounded the corner and saw the lake in its glory and the purpose built 2 story building of the dive centre with a fairly large car park behind. As we were fairly early there was plenty of room in the car park, it was that or the fact it was lightly snowing and 1C. We had a wander around checking out the dive map and shop, where Ralph and Kurt bought the Lavacore Thermal Short Sleeved Shirt which was the second best buy of the day as far as I was concerned, the copious amounts of tea at 80p a cup beat everything else hands down (except the dive of course). 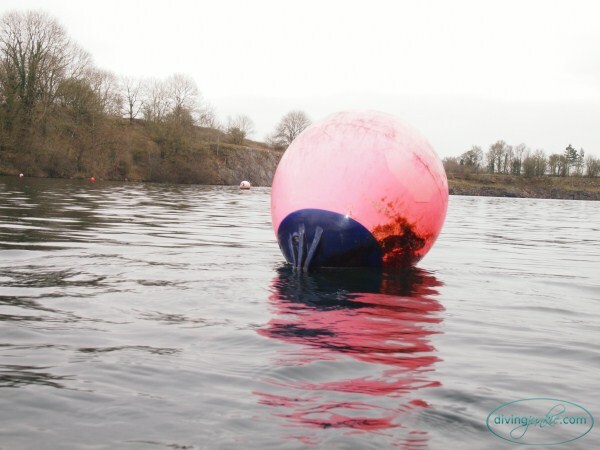 We had decided to enter the slipway to tease ourselves into the cold water of Vobster Quay’s lake instead of brain freeze from jumping straight in, it was a wise choice as the water was colder than we had expected. Entering the water this way we had to go round to the right of the picture above where it was just deep enough to don our fins. Discussing our dive earlier over a tea we had opted for going to the buoy (number 14) for the tunnel and keeping ourselves about 3m apart as we went through to experience what it was like. It was here before we descended I took what could have been the last photo with my camera as I had not tested the case any deeper than 5m so far and that was without the camera. We descended and came down at the entrance to the tunnel the vis was amazing at least 8-10m, I was at the rear and could clearly see Kurt ahead of me as I was exploring with my torch in the dark. The tunnel reminded me of the old air raid bunkers where I had grown up and keeping myself in the centre line was a lot easier than I had anticipated after hearing tales from cave divers. As I frog kicked my way through I thought to myself that a course in cave diving is definitely for me at some point in the future when I have at least a couple of hundred dives behind me. After what seemed like seconds we were out of the tunnel and found piles of concrete posts and rubble below us covered in silt and this was where I took my first ever (I proudly lost my virginity) photo underwater with my camera. My proud moment taking my first ever photo underwater. f13 1/160 ISO500 and a lot to learn. After taking a few more photos I decided I would concentrate on the dive as it was extremely cold, well my hands were as my gloves have holes in them and I couldn’t operate the buttons properly on the housing, while I have been in the sea when it was 7C before I wasn’t wearing these gloves at the time. Even after 10 minutes in the water my hands were really starting to hurt so we pushed on and followed the trench up away from the tunnel heading toward what we thought would be the car at 24/25m. We seemed to have lost our bearings and after another 20 minutes of exploring around us finding nothing but silt floor as we followed the wall we started to surface. With about 85bar air left I was relieved my hands would soon be wrapped around a nice cup of tea. We made our safety stop at 5m for a good 5 minutes as Kurt was playing with his GoPro giving me a chance to get my breathing right back down to the rate I normally have in the sea and then came up to find we had gone to the far side of the centre of the lake and 50bar left. I was gutted to be honest as I didn’t go back in for another dive after it took a while for my hands to warm and stop hurting and it was 2 big lessons learnt. After something to eat and a change of clothes I helped Kurt and Ralph get their kit on and get back into the water for a second dive just over an hour later, they decided to go straight to the Crushing Works (buoy 12) and then have a look around the plane. Meanwhile I was chatting to other divers and warming my hands. When they came out about 40 minutes later I helped them with their tanks and kit after another tea and we chatted about the awesome time they had in looking around the things I missed. Ralph and Kurt then went to pay and we left for the drive home, it was an awesome day and can’t wait to go again, this time with the lessons learnt a lot more care over certain aspects of the dive. It is an extremely impressive site, the staff were all friendly and really helpful, the cost wasn’t as bad as I thought it would be and owe Ralph a few dives to say Thanks for covering my bill. The amenities at the site are more than enough, a heated changing room and hot shower, separate toilets, air and Nitrox fills, the shop is one of the best stocked shops I have seen. It is a site I would recommend to everyone to experience but would have to say make sure you have good gloves and a hood, lake diving in cold water is totally different to sea diving when it is cold. 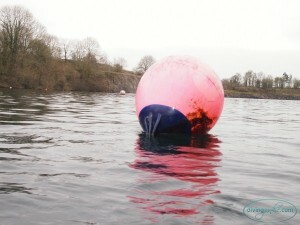 Vobster Quay rates in the top 3 of my dive sites so far and am really looking forward to later in the year to visit it again.